I honestly didn’t know there were real CLUES in this photo but those of you who have either eagle eyes (!) or the ability to “adjust” light/dark, or even have BEEN here yourselves, figured it out. 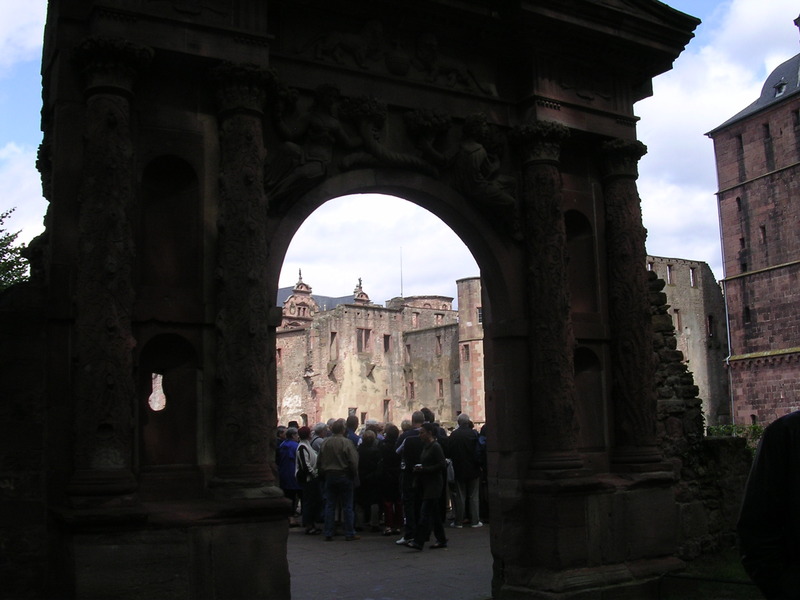 My parents were on a cruising vacation along the Rhine River and visited Heidelberg and the beautiful castle grounds one day on their tour………..this is the gate at the entrance to the castle complex. It truly was one of the most beautiful views from on top of the hill overlooking the town of Heidelberg and the buildings associated with the castle were impressive. Now I have to take my Mom’s word for it because I was NOT there…….I was home in Virginia safely boarded at my most favorite boarding place EVER – The Paws Awhile Pet Hotel. They spoiled me even more rotten than I already am! So who guessed it right? As of time Mom helped me write this (4PM Eastern USA time Tuesday) here’s the hug winners list! I’m so flattered to be a bit of a creative effort on Miss Cat’s part…………she seems like a really super and VERY talented lady and I sure have enjoyed meeting her (Mom has too). Her music is great. Today we’ll all find out how the Auction on Mollie’s went so don’t forget to stop by and check things out. We hope a whole pile of money was made on Leo’s behalf. Leo needs all the help we can give him! Happy Wednesday and concatulations to Teaser winners………….the rest of you? Next Tuesday you have another chance for BIG SAMMY HUGS. YES you do – help yourself!!!!! Hi Savvy……Easy seems to ALWAYS be right!! Isn’t that tribute by Miss Cat fabulous???? I had no idea where it was but love the Sammy Hugs for the winners. Maybe post somewhere in the UK and I might stand a chance…lol! You never know WHERE my Teaser photos will come from AND my parents have been in the UK so you never know – – – – maybe next time it will be somewhere you recognize?!?!?!?! I didn’t have a clue lol, but big congrats to the winners. Hi Misaki! Mom and I are just getting here this morning but I’ll stop by and take a peekie at your blog now!! Concats to the hug winners! And I’m heading right over to see you over at Cat Forsley’s! My boycatfriend is a STAR (but I already knew that!). Have a good day, Sammy! Buddy, I’m so embarrassed to say this, but you forgot to put my name there. My answer was clearly right! I know, it happens, you probably forgot to add me there, it’s ok, we are cool. I hope it doesn’t happen again or I will have to tell who ate Freddy, just saying. A huge, Huge, HUGE Congratulations on Miss Cat’s blog mentioning you, Sammy!! You are now officially a Celebrity Cat Extraordinaire! I know – isn’t it fantabulous? I’m a star! And I only had to wait until I’m thirteen years old to get there (tee hee). Congratulations to the winners! I will be back to check out your link to Miss Cat! Hi Miss Pix! Way cool on Cat’s mention of yours truly today………AND I’m there with my buds the moggies, June buggie and Alfie too! We’re ALL stars! Oh I’m pawsitive moths have good nutritional value….and they make such a lovely CRUNCH when you bit ’em don’t you think????? This was Mom’s second visit to Heidelberg – she was there as a little girl with her family then back again with my Dad on vacation. You’re right – it’s gorgeous there…..my parents would love to do that SAME cruise again on the Rhine that they did back then too – it was FANTABULOUS. Tee Hee…..moths are yummy…..Sorry you missed the Teaser but maybe next week????? Say – I’m PROUD of you for only being 400 miles away with your Teaser guess……….I think when you’ve got the right PLANET it’s worth a hug don’t you??????????? pea ess….we dunno who da tabbuies iz…see above post spellin, but they canna spell any mor than we can !!! we haz had two much trout all reddy coz now we canna even see R own post bout knot bein abe bull ta spell R own names post !!! weeeeee bring on de nip !!! Sammy! mes would has knowed – IF Mommy had helped mes look at blogs, but NO, the Farm Market came first! Mes is only getting half hours of blogging time on her days off! Its the Heidelberg Gate and me knows that cause ot was on a Kraft beer label! PS Eddy is my hero! Hi Nellie!!!! I hope that your Mommy will get her priorities straight soon so you can visit all of us more often cuz we MISS our Nellie Bellie!!!! Anyway, I know she’s having a good time with her farm market biz and we should be happy for her and your Dadd…………since you knew the Heidelberg gate I think you should get a hug though don’t you????? 🙂 we always love Sammy hugs! Btw, we’d love to see a post about that fab pet hotel. Oh Miss Layla I’ll have to do one on Paws A While (Mom calls it “camp”). They love me there! When Mom and Dad were stuck in Paris on 9/11 they kept me extra days until Mom and Dad could get home AND didn’t even charge them – how nice is that?! If I have to stay somewhere when Mom and Dad go away THAT’s the place for me………..
You’re beautiful in Cat’s collection, Sammy! I bet you are a great writing helper for your Mom. I’m pretty sure my mom likes when I stare at her while she works. It doesn’t creep her out or anything……. Hi Cupcake! I’m glad you thought I looked good in that nice tribute Cat put together. I was rather pleased to be included – she’s the nicest lady too and ever so talented!! I spend a lot of time staring at my Mom too Cupcake…..I’m waiting for her to look right back at me and say “out? ?” or “treat? ?” or “BACON? ?” – that gets my attention!! HAHAHA! Don’t worry – my blog about the book is on Friday and I won’t be telling ANYTHING about how it ends – just a bit about what the idea is and especially about Eddy the Cat! Oh now guys…..come on…..your Mom has guessed before and one of these days you guys WILL get it right and hugs will be forthcoming! I have GOT to sign up for some geography classes, or somethin’. HA! Well Nissy you’re still under house arrest anyway so you couldn’t attend any classes for a while yet…..! I haven’t been able to get to your teaser in time to guess for the last few weeks. 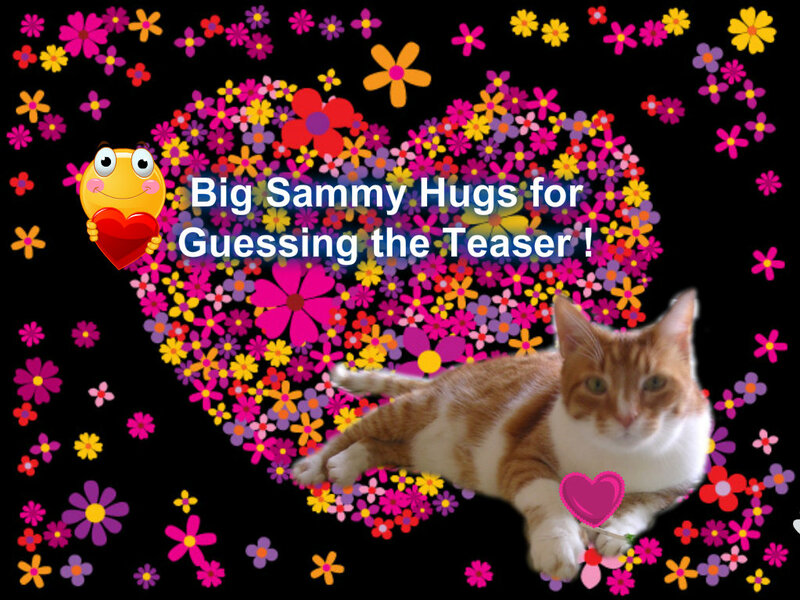 I really hope to this week coming – so make it an easy one so that I can claim my Sammy hug! I’ll see if I can find some photo that will be easy to guess JUST FOR YOU Clowie but you know I’ll give you a hug any time you want one!! There’s always a Clowie Cuddle available for my pal Sammy!